Scribner Book Company, 9780743203661, 288pp. 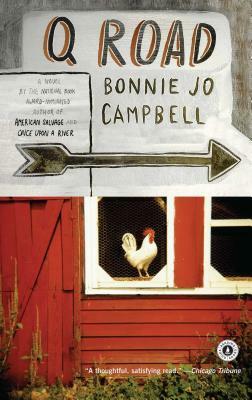 Combining the modern-farm-life realities of Jane Smiley's A Thousand Acres with the quirky humor and eccentric characters of Carolyn Chute's The Beans of Egypt, Maine, Q Road is a charming debut from Bonnie Jo Campbell. Greenland Township, Michigan: On the same acres where farmers once displaced Potawatomi Indians, suburban developers now supplant farmers and prefab homes spring up in last year's cornfields. All along Q Road--or "Queer Road," as the locals call it--the old, rural life collides weirdly with the new. With a cast of lovingly rendered eccentrics and a powerful sense of place, Q Road is a lively tale of nature and human desire that alters the landscape of contemporary fiction. Bonnie Jo Campbell has won a Pushcart Prize, as well as the Associated Writing Programs Award in short fiction for her story collection, Women and Other Animals. She lives a few miles from where she was born in Kalamazoo, Michigan. Writing with extraordinary empathy and grace...Campbell raises to our ears a sound not heard often enough: the heartrending cry of the human heart in all its flawed complexity. Campbell's spare, evocative prose is pure artistry, but her unusual characters and her unique way of linking the continuity of time with the land's inhabitants prove her a writer to watch. The broad tableau of aluminum siding versus pig manure is rendered here with delicate, exacting strokes. A thoughtful, well-paced, deeply moral (though not moralizing) novel full of hard lessons and the wisdom gained from them across generations.